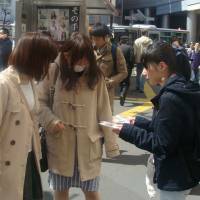 Volunteers from an Osaka-based group handed out almost 500 badges to commuters on Friday morning in the JR Shibuya Station area in a bid to help prevent young female school girls and college and university students from being groped inside train cars. 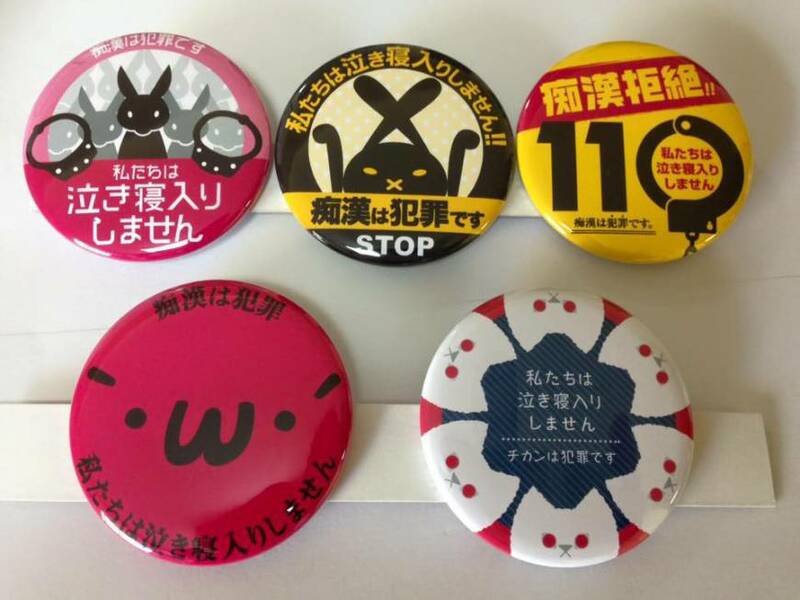 The badges were made because it’s difficult for teenage girls to raise an alarm if they are groped and people standing nearby won’t necessarily come to their aid, according to Chikan Yokushi Katsudo Center, the group behind the badges. Also, the group hopes the badges will help to prevent any false charges being brought against innocent men, and that they will help girls to be more confident and assertive so that incidents can be averted before they happen. “The badge says ‘I won’t let the matter drop.’ It’s small but is a great help, because it is difficult for young girls to be brave enough to raise their voices and to deter any would-be gropers,” said Yayoi Matsunaga, a representative of the center, which was founded in January. 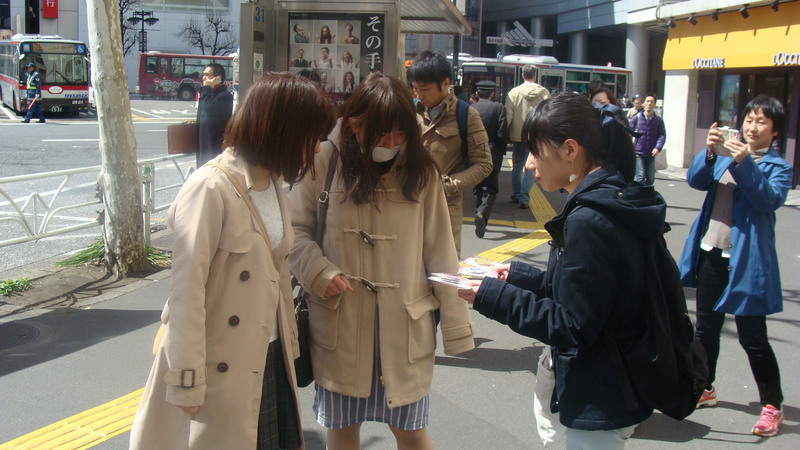 Research carried out in 2010 by the Tokyo Metropolitan Police found that 3,880 men were arrested nationwide for alleged groping incidents in 2009. During the same year, however, 340 men were arrested on trains or in railway stations across the country on groping charges. The same report shows that 89.1 percent of the victims did not report the incident. The badges were originally designed by a female student attending a high school in Tokyo. The girl and her mother, Mari Tonooka, designed a tag that had “Groping is a crime” and “I won’t let the matter drop,” written on it, and attached it to her school bag. Although she had often been groped, since attaching the badge to her bag, she has not been groped once. “She was safe during the morning commute as there are now dedicated carriages for female passengers, but not during the evening. “She tried many ways to prevent men from groping her, and reported any incidents to the police and railways,” said Matsunaga. “Her attempts, unfortunately didn’t help. However, the badge did,” she said. Matsunaga, a longtime friend of Tonooka’s, was surprised by the effectiveness of the tag, and decided that it should be available to the public in the form of a badge. “Since the tag used by Tonooka’s daughter was very big and handmade, I thought making a smaller badge would be more convenient for girls to use,” said Matsunaga. 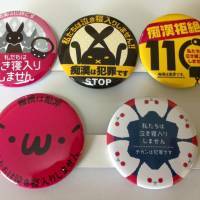 A budget was obtained through a crowdfunding campaign titled “Stop Chikan Badge Project,” which raised a total of ¥2,120,000 during the three months following its launch in November. The badge’s design was also solicited through crowdsourcing, and out of 441 submissions, five made the final cut and were used. The badges can be purchased online for ¥410 each via a website. Matsunaga and members of Chikan Yokushi Katsudo Center are scheduled to distribute the badge at two stations in Kobe, Hyogo Prefecture, and outside JR Osaka Station on Monday. “We were able to distribute all the badges today, and I felt happy giving it to young girls who knew about it. They took a bunch to give to their friends,” Matsunaga said, adding that not just young girls but men and women also took some of the badges to give to their daughters to use.